Mr Agus Sari was the Deputy Chair of the Indonesian REDD+ Management Agency in charge of planning and financing. Prior to that, he was the Chair of Funding Instruments under the Indonesian Presidential Task Force on REDD+ where he led efforts to design a financial and funding mechanism that incentivizes activities related to greenhouse gas emission reduction due to deforestation and forest degradation. A Fulbright Scholar who graduated from University of California (Berkeley, USA) with a degree in Energy and Resources Group, he was previously the Country Director and Regional Policy Director for Ecosecurities, the world’s largest carbon asset development company. Ecosecurities Indonesia, under his leadership, was awarded Asia’s Fastest- Growing Renewable Energy Company by Frost & Sullivan in 2009. 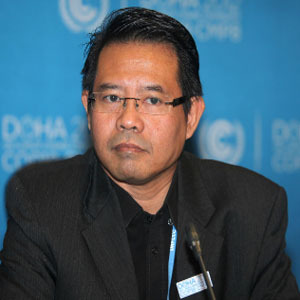 Until 2007, Agus Sari was a member of the Intergovernmental Panel on Climate Change, a Nobel Prize-winning panel and the world’s leading authority on climate change. The former Executive Director of Pelangi, an environmental think-tank, also lectured Environmental Science at the Indonesian Institute of Technology in Serpong, Indonesia as well as Carbon Politics at the Bren School of Environment at the University of California (Santa Barbara, USA).